Game designer Elizabeth Sampat has now made apologizing easier to do with her latest project. 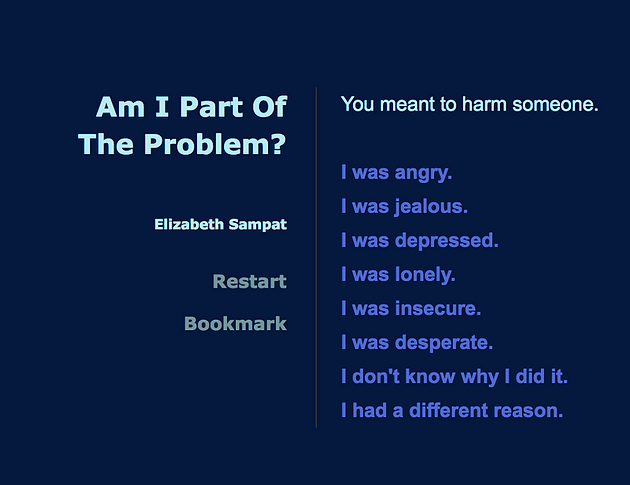 “Am I Part of the Problem?” is a judgment free website that helps both victims and wrongdoers understand their emotions and their situation. It can even help you draft the perfect apology. When entering the site, you’ll be greeted by a brief introduction statement clarifying that the information you provide will never be “recorded and will never be shared.” The site also claims that is it not an exercise of forgiveness or empathy, but rather a process of understanding. To begin the process, simply respond to the program’s questions by clicking on various response options. The interaction is based on how you choose to respond and how honest you choose to be. The program responds objectively, guiding the user throughout the process so that they can decide how to move forward once the interaction is over. The website breaks down all the aspects of the situation, starting with “intent,” for example.The site defines “intent” and explains its importance, and the user must consider if they were aware of their intentions or not. If yes, they must then choose from a series of “intents” and the entire interaction begins. I tested the website for myself, and at first I thought the idea of an interactive apology drafter was hilarious. What I actually came to find was a website that we never knew we needed. It’s easy to use and easy to look at. There are no ads or graphics to distract you from the process. The program is also very direct. It tells you what you need to hear, and the options you have moving forward. Either you hurt someone or you didn’t, but your actions had impacts. So what are you going to do about it? This is a question that “Am I Part of the Problem?” was designed to help you answer. The site reassures that you aren't a bad person for making a wrong choice. The point is: it's not all about you. "Am I Part of the Problem?" simply asks you to consider how others feel in comparison to how you feel. In the end, Sampat leaves us with messages of encouragement, urging that apologies are not a sign of weakness, but a necessary act that will help everyone involved heal properly. Sampat dispels the negative stigma that revolves around apologizing and her website makes it easier for all parties involved to understand how they feel and how to make amends. 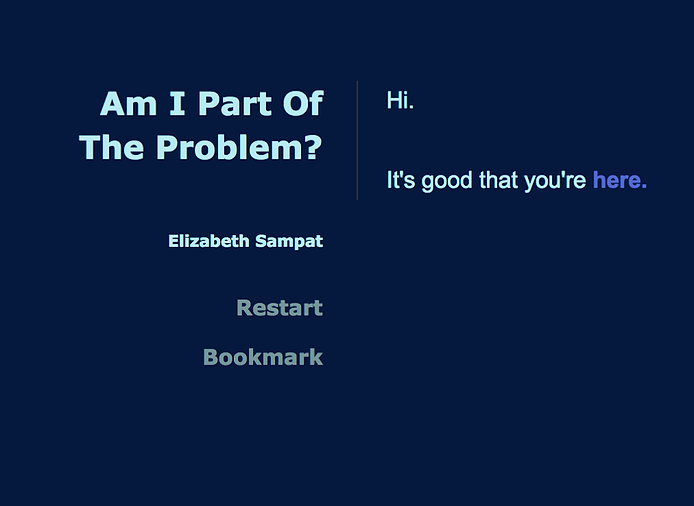 Next time you’re having trouble saying sorry, visit “Am I Part of the Problem?” for guidance and advice.